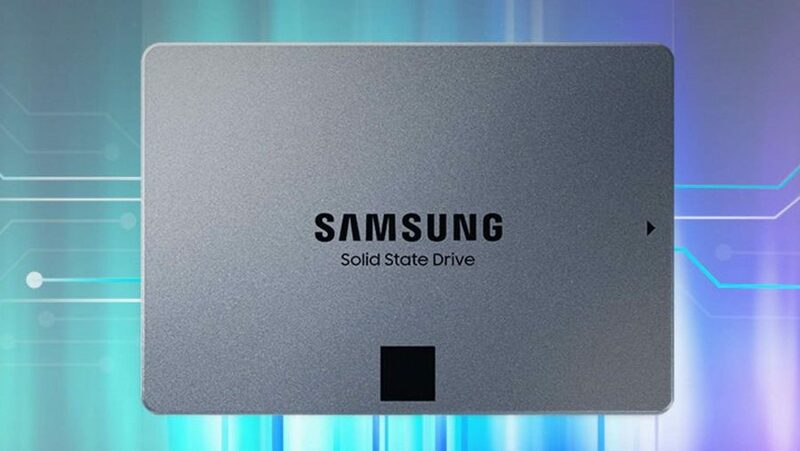 Samsung may not be the first to release a QLC SSD, but the 860 QVO is the first mainstream SATA drive to try and deliver on the promise of high-capacity solid state drives at a price to rival large scale spinning platter storage. It was Intel who blinked first, releasing its 660p NVMe drive into the market, but this is the first standard QLC SSD we’ve plumbed into our test rig. What is this QLC stuff anyways? Well, if we actually start referring to it as Samsung does it becomes a little more obvious… 4-bit MLC is how the Korean SSD giant denotes the latest NAND technology. QLC, or 4-bit MLC, is essentially a method of increasing the capacity of a NAND chip in the same physical space. It does this by allowing the memory to store more bits in each cell. Being able to store four bits per cell, as opposed to three bits in TLC; two bits in traditional MLC; and just a single bit in SLC, does boost the available storage, but it also comes with its own share of downsides. The first thing is that it is inevitably slower than any other kind of NAND, partly because it needs to spend more time making sure that it is reading and writing with the same level of precision. QLC memory controllers need to be damned good at error correction. The other issue is that QLC NAND has a lower endurance rating than its forebears too, which is a struggle when most of the key features of new SATA drives from the last couple of years have surrounded their increased reliability. But these are all issues we had when 3-bit MLC, or triple-level cell (TLC), NAND was first introduced to the market. 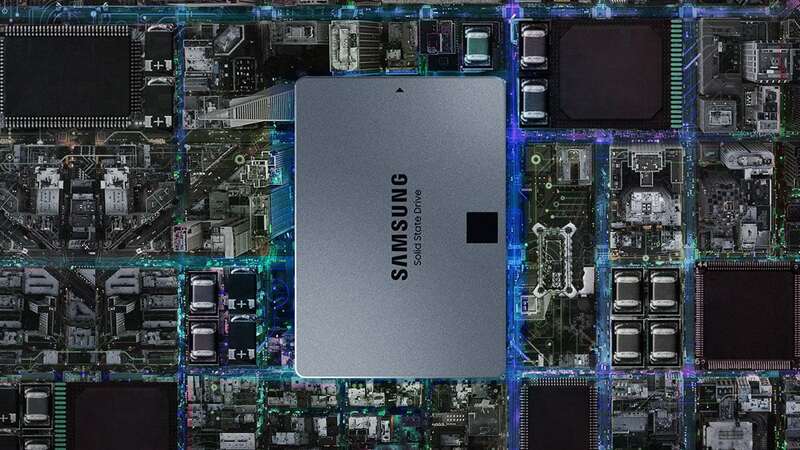 It was always held as a far slower entity – hence why Samsung continued to create its Pro drives using 2-bit MLC and its EVO range with 3-bit MLC – and was damned for its lower endurance. Over the years, however, TLC’s performance shortfall has largely been mitigated by ever-smarter SLC caches and the advances in memory manufacturing has improved the endurance levels beyond what any normal PC gamer could need. 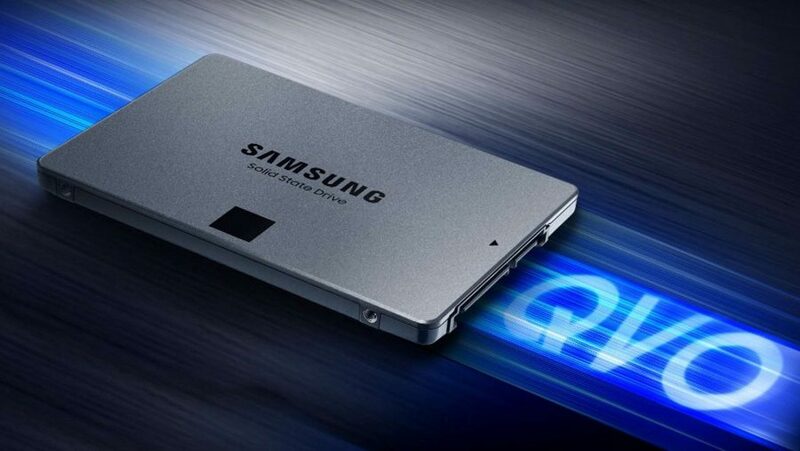 If you look at the mighty Samsung 860 EVO it’s offering a 5 year or 600TB total bytes written (TBW) warranty, and can deliver general SSD performance easily on a par with its more expensive 860 Pro brethren. And pretty much all the ways SSD manufacturers can mitigate the issues with TLC they can re-target to deal with QLC. That’s why this Samsung 860 QVO is, to all intents and purposes, identical to the 860 EVO besides its use of Samsung 4-bit MLC V-NAND. It uses the same MJX controller, the same 1GB LPDDR4 DRAM cache, and the same smart TurboWrite SLC cache technology. 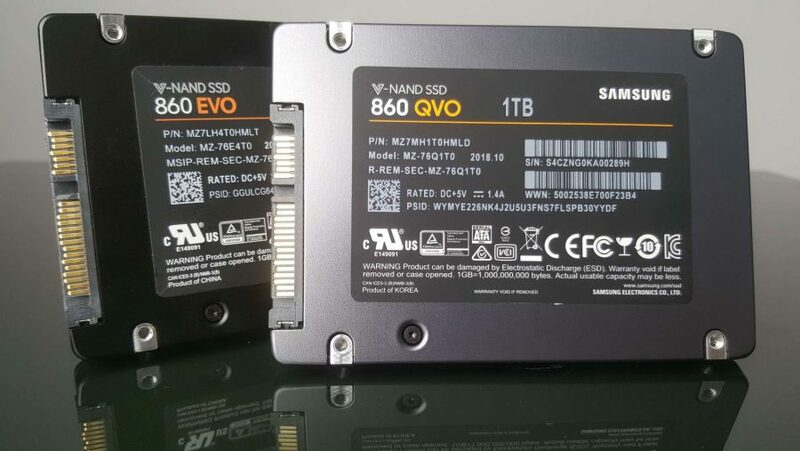 What that also means is that the overall performance of the Samsung 860 QVO 1TB drive is incredibly close to the 860 EVO. In terms of the sequential read/write performance the ATTO pace of the QVO actually outstrips its TLC-based sibling. It also manages to post higher write performance in the incompressible AS SSD benchmarks, though does display slower read speeds than the EVO. It’s also a little off the pace when it comes to the 4k random read/write performance too, but not by enough that those results alone would put you off using it as the boot drive for your next gaming rig. What might do, however, is the actual real-world performance of the Samsung 860 QVO. Its 5GB folder compression performance is right up there with the best, but when we copy a 30GB folder of mixed file types we saw the slowest performance since Crucial’s ropey BX200 or OCZ’s Trion drive. Realistically, however, the 30GB folder write shouldn’t have taken up the total TurboWrite space designed to mitigate the slow speed of QLC memory. The SLC cache used since the 860 EVO provides 6GB of static SLC as a constant cache allocation, but if constant, or directly consecutive, write operations exceed that – and there is spare capacity – the drive is able to apportion up to an extra 36GB for a total TurboWrite cache of 42GB. On the 2TB and 4TB versions that goes up to 78GB. So our standard large scale transfer shouldn’t have caused it such problems, but as the write operation continued into its sixth minute we could see the performance of the drive crawl. That’s because away from the SLC cache the 4-bit MLC has a rated sequential write performance which drops from 520MB/s to 80MB/s. The 3-bit MLC on the 1TB 860 EVO, on the other hand, drops down from 550MB/s to 500MB/s; a barely noticeable drop in pace. 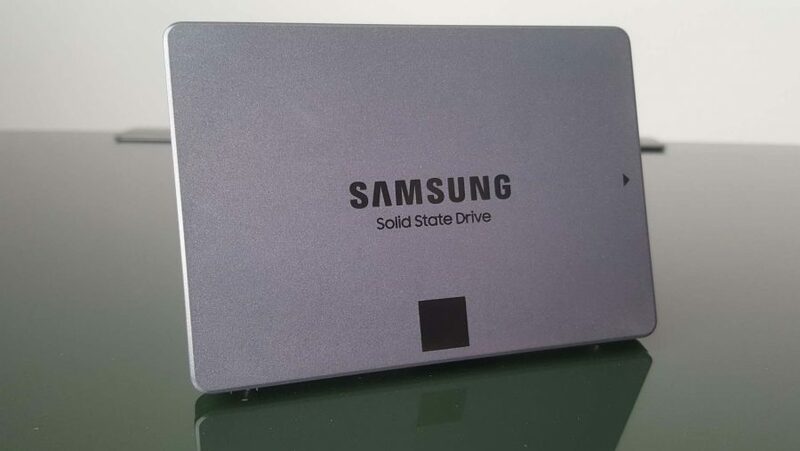 Though none of that would be a problem if the Samsung 860 QVO drive was any cheaper than it is. At launch we’re looking at a 1TB SSD that costs £137, while the same capacity EVO drive is only a little more at £170. Admittedly that is far lower than at its own launch earlier this year, where it cost over £250. But right now that’s still the 1TB option from Samsung I’d recommend, though the £136 Crucial MX500 is also a mighty tempting option with its own Micron TLC 3D NAND, but with lower endurance. This is my main issue with this first-gen QLC SSD. The big thing for the new NAND tech is that it is supposed to be cheaper than TLC, which should help mitigate the performance and endurance shortfalls inherent in the memory design. But if you can buy solid, reliable, faster TLC SSDs for around the same price, at the same capacity, what is QLC really offering? But, as I say, this is the first generation of a new memory technology, and Intel’s NVMe-based 660p shows the tech has some pacey legs when paired with a high-speed PCIe interface. And, when you look at the drop in price the 860 EVO has had since the price of NAND has started to dip again, it’s possible to see a time where the 860 QVO becomes a no-brainer for extra SSD storage capacity. Though maybe not necessarily as a boot drive. While the overall amount of writes the 860 QVO is rated at – 329GB/s per day – is the same as the total writes over time for the 860 EVO, the expectation is that at that level of effort the QLC-based drive might be on its knees in three years where the EVO could last five years. Obviously if you’re writing 329GB/s per day then you’ve got storage problems more intricate than which NAND tech you need, but it is indicative of a higher level of trust in the EVO than in the longevity of the QVO. And with all the grunt work your OS drive does on a daily basis you’re going to want the more reliable SSD for that. But these are the same issues TLC had when it first reared its head, and that has turned out to be the most successful consumer SSD tech around – subsequently achieving far higher endurance levels than any PC gamer is likely to need. So while we’re not falling over ourselves because of Samsung’s 4-bit MLC just yet, that could quickly change as prices drop on QLC NAND and new QLC memory controllers raise performance and boost endurance. The Samsung 860 QVO could be an important, affordable SSD of the future. But right now there are better, faster TLC drives on the market, at the same capacity and around the same price, that we’d have to recommend over a QLC SSD.